Prominent philanthropist Dr Fong is Chairman of Hip Shing Hong Group of Companies and Kam Wah Investment Company Limited. 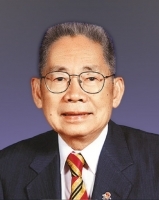 Through the Fong Shu Fook Tong Foundation and the Fong’s Family Foundation, Dr Fong has dedicated tremendous efforts to the development of education at all levels. Dr Fong was bestowed the coveted honour as one of the Ten Champions in Charity of China in 1997 and is the second Hongkonger who had this honour.